Interested in physical and psychological relationships to objects and situations of the home Jennifer Stillwell reconstructs, only to soon dismantle, a living room ensemble. From wallpapering to placing accent lamps, Stillwell establishes a plausible interior space. This interior is then dismantled and baled. 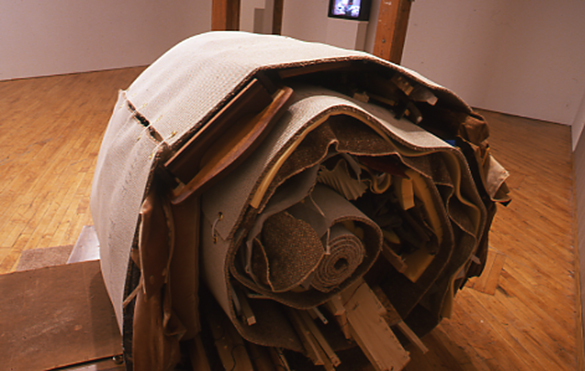 Both performative and installation-based, Bale charts the positioning, take-down, and eventual homogenization of a space. JENNIFER STILLWELL is a Canadian interdisciplinary artist based in Winnipeg. Her work encompasses sculpture, installation, performance, and video. Jennifer received a MFA from The School of the Art Institute of Chicago in 2000 and a BFA from The University of Manitoba in 1995. Over the last seven years her work has been exhibited and screened nationally and internationally.